Indonesian custom bike building. It probably brings to mind images of hand-beating metal parts while enjoying a beer and the sun in a tropical paradise. But if it did, you’d be dead wrong. Because for Ram Ram Junuar of Bandung’s White Collar Bikes, only the latest and greatest techniques will do. 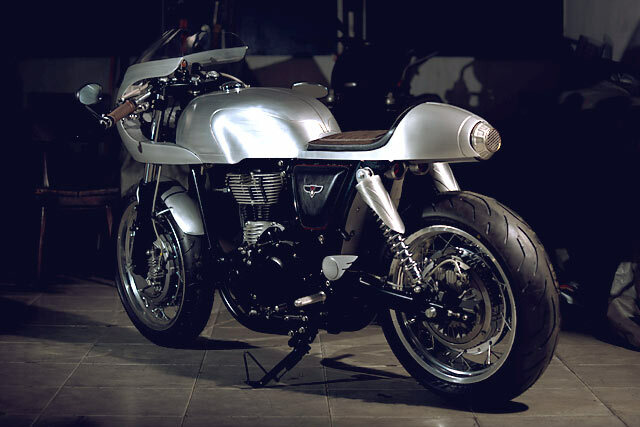 So with processes that would put most Western shops to shame, he’s built this classic-meets-modern Continental GT for Royal Enfield Indonesia. “We prefer to build our bikes from zero,” says Ram from his shop floor. “We start with an engine and then we’ll build a frame and some one-off parts. Honestly, we try to buy as little as possible. Now it all depends on the budget, but we can always get what we want. 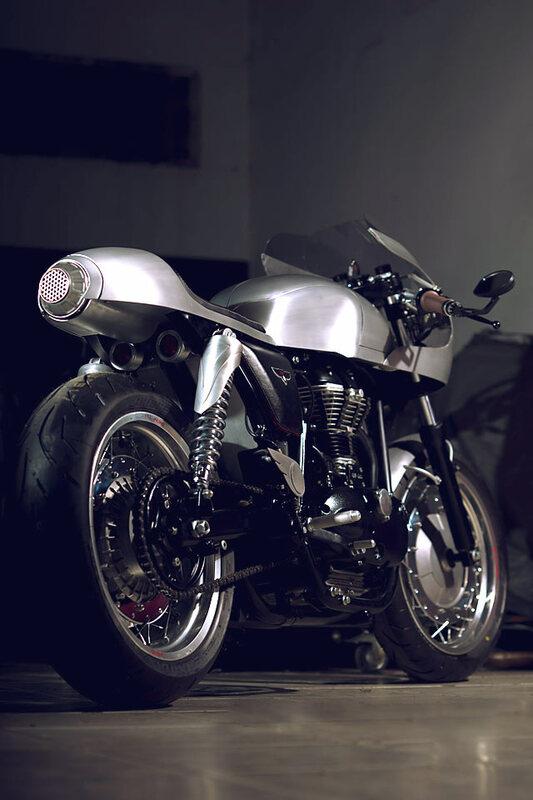 With that approach in mind, we were asked to build a bike as a collaboration between White Collar and Royal Enfield Indonesia. 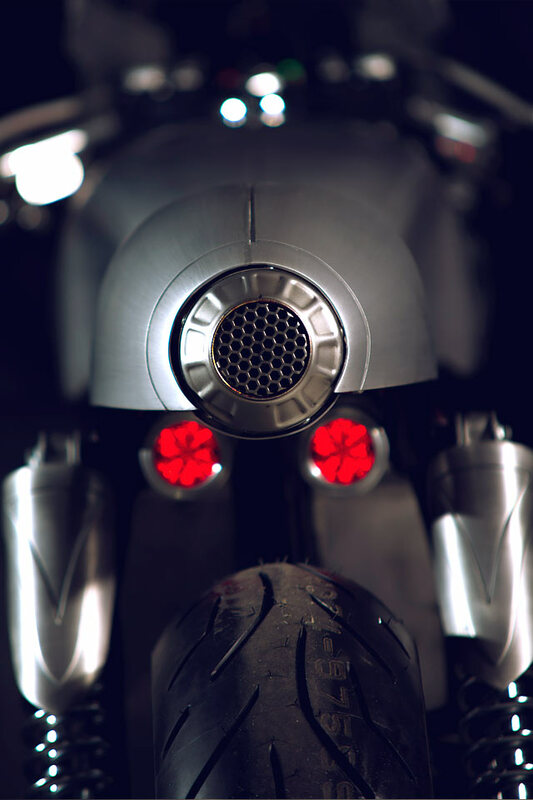 They came to me and said they wanted to build an iconic bike that would represent the brand here”. 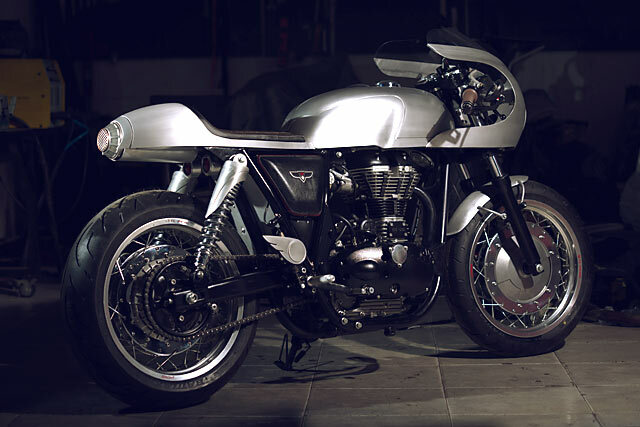 With a carte blanche brief from the company, Ram chose a Royal Enfield GT Continental for the donor bike. 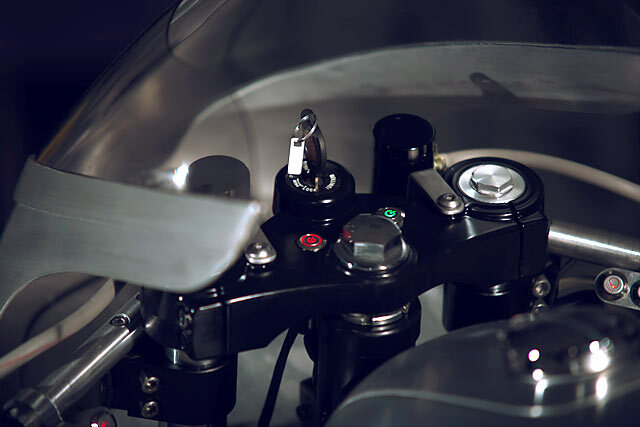 As for the build itself, it was agreed that the end result wouldn’t be a completely new bike, as there had to be a clear connection between the custom bike and the one you could buy in the showroom. 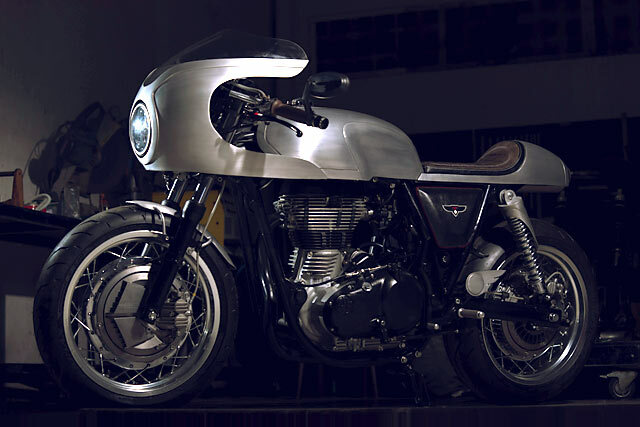 “Also, since the GT is already a cafe racer, I didn’t want to change the style of the bike too much; I had to remind myself not to go crazy with the build. That was probably the hardest part”. 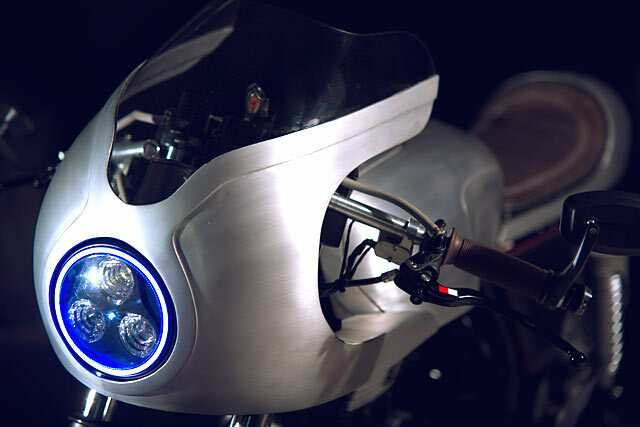 So when an idea to create something in raw, hand-brushed aluminum came to mind, Ram began to convert the bike taking shape in his head into a 3D rendering. The initial renders featured an Avon-style clear nose after-market fairing. And damn, it looked good. But as Ram said, “Why would you buy something that you can design and make yourself?” So it was decided to make the fairing from scratch and when you see it in all it’s glory, you’ll be glad he did. Going from the sublime to the traditional, Ram then made clay models of both the tank and tail section directly onto the donor bike’s frame as a proof of concept and to ensure the lines work both on and off screen. Once satisfied, sleeves were rolled up and the hard work really began. “The front and back wheels and hubs came from an old Honda CBX550F. They were converted into wire wheels with TK rims and Bridgestone Battlax tires. We then replaced the factory forks with an aftermarket front end and shortened it to achieve the desired racing look”. The factory swingarm is still being used, all be it with some minor modifications to add a few inches to the wheel base. “I had to do this because the bike’s exhaust pipe is running directly under the tail, so it’s very close to the rear tire. Basically, I had to move the wheel backwards to create a gap. This also means a new, longer chain”. After years of experience with aluminium, Ram has perfected a new technique he intends to develop even further on upcoming bikes. “The lines on the gas tank and seat are not painted or welded. They were achieved with layered aluminium sheets which were then welded together from the inside. It’s very difficult but definitely worth all the effort. 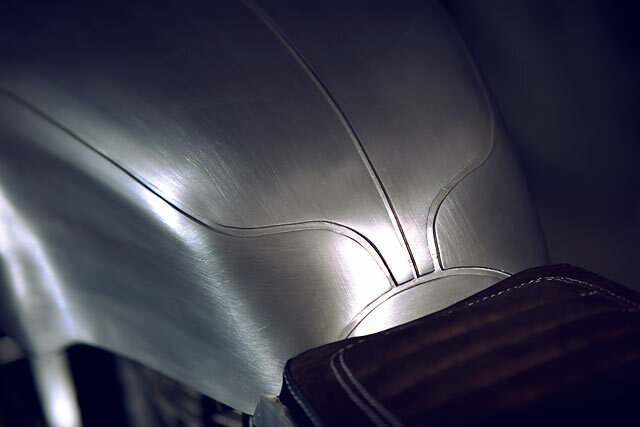 The gas tank looks like it was carved from a solid piece of routed aluminium, which I really like”. “The rear shock absorbers came from my Thruxton. They have classic looks and proven performance, so I’m using them here. After mounting them, I made a cover for each one using aluminum sheet and the same technique as the gas tank”. 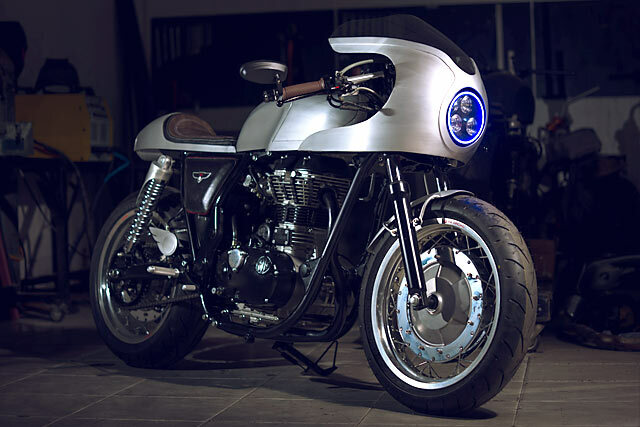 The final touches on the cafe build included some of White Collar’s own switchgear, twin custom brake lights, billet aluminium footpads and some really unique foot guards. “To tie everything back to the brand, we made new, layered foot guards and then etched the Royal Enfield logo into them”. 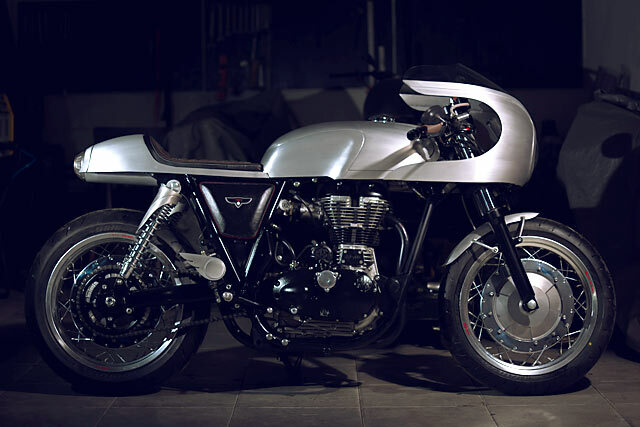 We’re pretty sure that Royal Enfield would be royally stoked with the results.